Palm Beach, FL – March 5, 2019 – Aquaox, LLC, a technology licensing and manufacturing company specializing in the development and use of Electrochemical Activation (ECA) was announced as an approved vendor of Nilbribe. Aquaox has been implementing its cleaning & sanitizing system on cruise lines for a number of years, but the addition to the Approved Vendor list will strengthen and build upon the existing relationships. Nilbribe is a third party, independent company, managing the buying and selling of products and services. 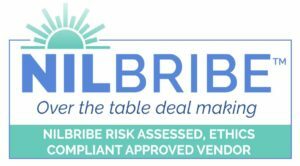 Nilbribe guarantee the highest standards of ethics and compliance. The Aquaox Infection Control System produces on-site generated Electrochemically Activated cleaner and disinfectant fluid solutions that allow cruise lines to move away from traditional disinfectants that are toxic and can cause harm to the housekeeping staff and passengers to a cleaner and a disinfectant that are safe, environmentally sound and greatly reduce the damage to furnishings and equipment caused by toxic chemicals, yet is effective against norovirus and microorganisms. Nilbribe qualified companies provide services and products. Buyers will find an additional resource of suppliers with new ideas and competitive alternatives. Cruise lines can purchase through Nilbribe, at Zero/no added cost. Michel van Schaik, Aquaox’ CEO, notes: “The ability for Aquaox to present our company and sell our products through Nilbribe, benefitting from an Approved Vendor status will help us implement our cleaning and sanitation solutions aboard cruise vessels. PALM BEACH, FL – Aquaox™ LLC, a leading manufacturer of Electrochemical Activation (ECA) water generators and solutions is pleased to announce it has entered into an exclusive distribution agreement with Safety Net, LLC for the healthcare industry. Safety Net™ is a provider of solutions that promote safe, healthy living and working environments for hospitals, long-term facilities as well as community settings such as homes and businesses. Michel van Schaik, CEO of Aquaox™ commented, “We are thrilled to announce this new partnership. Safety Net America has a very strong understanding of the healthcare industry and their experience and extensive network of over 200 sales representatives servicing more than 1,000 hospitals make them the ideal partner for Aquaox™”. Safety Net will begin rollout of the Aquaox™ product line and services through their entire network later this month. DILLSBURG, PA – Silversea Cruises has been recognized as the gold standard in luxury cruising and acclaimed both for its legendary European lifestyle and global reach of destinations. In the US, Silversea has received numerous awards including being voted “World’s Best” by the readers of Condé Nast Traveler (nine times) and Travel + Leisure (seven times). In spring of this year SilverSea Cruises will commission their new ultra-luxury flagship, the Silver Muse and as part of their ongoing commitment to providing a safe, clean, healthy environment for their guests and staff, SilverSea Cruises has made the sustainable choice to generate cleaning and sanitizing solutions on-board using the new Aquaox KECA 50 sanitizing solution generators. The KECA 50 is an innovative, compact, on-site generator that produces non-toxic, non-corrosive, powerful, sanitizing solutions. It offers unprecedented versatility, convenience and cost-effectiveness by generating high volumes of safe, environmentally friendly, highly effective sanitizing solutions on-demand without the need for dilution or mixing of harmful chemicals. “Our compact, on-site generators are a perfect match for Silversea Cruises and we are looking forward to supporting their commitment to sustainable practices and passion for providing a safe, secure and healthy shipboard environment for their guest and staff,” said Michel van Schaik, CEO of Aquaox LLC. DILLSBURG, PA – Aquaox LLC, a leading provider of Electrochemical Activated Water generators and solutions to businesses in a wide range of industries, including healthcare, food processing, schools/education, and environmental service providers has announced it will move its office and manufacturing facility from Fontana, CA to new, larger quarters in Dillsburg, PA to better serve customers and position Aquaox for sustainable, long-term growth. The new 40,000 square foot facility includes concrete entry ramps designed to accommodate trucks and heavy machinery and oversized overhead doors to enable large-scale tanks and vessels to be moved easily in and out of the building. Van Schaik said the building’s close proximity to the US Route 15 will also benefit customers and employees. Aquaox’s new address is 220 S. Second Street – Dillsburg, PA 17019. The company’s main phone number will remain the same – (800) 790-7520 – as will all email addresses. FONTANA, CA—Current North Carolina Rules Governing the Sanitation of Hospitals, Nursing Homes, Adult Care Homes and Other Institutions (15 A NCAC 18A.1300) require patient contact surfaces in health care settings to be disinfected with EPA-registered hospital disinfectant. The EPA registration number on the label of all disinfectant products that enter commerce provides assurance that EPA has completed a data review to assure the efficacy of the product. FONTANA, CA–There is an epidemic of health care acquired infections within hospitals, out-patient surgical centers, nursing homes and other medical facilities. A major cause of this epidemic is environmental surface contamination. It is estimated that 40% of healthcare acquired infections are attributed to cross contamination from hands of patients, healthcare workers and visitors who come into contact with environmental surfaces. Aquaox and Johnston UNC Healthcare in Smithfield, North Carolina have partnered to address this growing problem and in November of 2014 entered into an initial 36-month contract for the use of the Aquaox Infection Control System (AICS) within the Johnston network of hospitals. This collaboration represents the first hospital network to adopt on-site generated Electrochemical Activated (ECA) solutions for their entire network. For the past eleven months, Johnston UNC Healthcare has been evaluating the AICS and has collected over twelve hundred swab samples in order to compare the AICS versus traditional cleaning and disinfecting methods. “Our results have been amazing and even better than expected…the AICS allows facilities to provide the very best possible method of cleaning and disinfecting of environment surfaces that can be provided for their patients, visitors and staff,” says Ronnie Syverson, Infection Preventionist at Johnston UNC Healthcare. The AICS generator produces two EPA registered anti-microbial solutions and a general purpose cleaner that dissolves proteins and emulsifies oils and fats. The first anti-microbial solution is used as a non-corrosive, fast-acting general purpose sanitizer. The second anti-microbial solution is used as a high level disinfectant, capable of killing all microorganisms including MRSA. “Using this new innovative technology we have been able to gain a 98% reduction of all microorganisms and pathogens on all tested surfaces in patient rooms. Being able to have onsite generated solutions has proven the ability to reduce our overall chemical cost, and the added cost of transportation, handling and distribution of an array of chemicals that are no longer needed,” according to Kyle McDermott, Sr. Director Support Services at Johnston UNC Healthcare. Aquaox and the AICS was the featured topic on the “Health Briefs” television segment, that aired nationally on the Discovery Channel, November 21st, 7:30 AM ET & PT, 6:30 AM CT, 5:30 AM MT.Hosted by Terry Bradshaw, Health Briefs takes a look at the dynamics of the medical industry and many of its associated important people and components.